Busy Linux administrators often need to use insecure terminals, such as a co-worker's desktop, to get their jobs done. 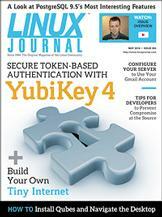 Todd A. Jacobs provides a modern look at token-based authentication using YubiKey 4. Use KVM to build a fully functioning “Internet” and learn all about Linux in the process.